Place of Birth: Shawnee, Oklahoma, U.S.
Brad Pitt is an American actor and producer. He was born in Shawnee, Oklahoma, the son of Jane Etta (Hillhouse) and William Alvin Pitt, and was raised in Springfield, Missouri. He was raised a Baptist, but no longer practices the religion. Brad is married to actress Angelina Jolie, with whom he has six children. 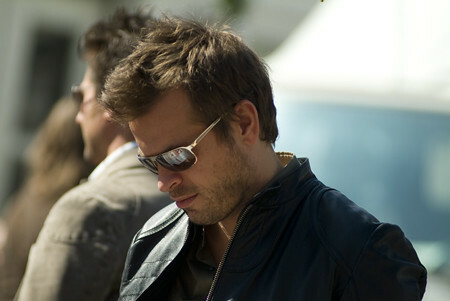 His brother is businessperson and philanthropist Douglas Pitt. Brad was selected People Magazine’s “Sexiest Man Alive” in 1995, and again in 2000. Brad’s family has lived in the United States for many generations. Brad’s documented ancestry is mostly English, with some Scots-Irish/Northern Irish, small amounts of German, Scottish, Welsh, and Irish, and remote Swedish, Dutch, and French. …probably… Irish-Scots, Germans who settled in the area… Native American Indian… I know we have some Seminole, and some Cherokee Indian, in us. 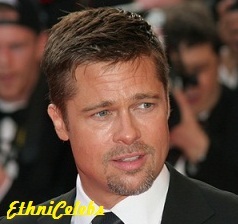 No Cherokee or Seminole Native American ancestors have been documented in publicly available family trees of Brad Pitt. While he did not mention English ancestry, English comprises much of Brad’s lineage. Brad is a third cousin, once removed, of actor Tyler Christopher. Brad’s paternal great-great-grandparents, George Washington Dorris and Nanny Rosalene/Rosaleen Smith, were also Tyler’s maternal great-great-great-grandparents. Brad’s paternal grandfather was Alvin Monroe Pitt (the son of Oliver Brown/Bruce Pitt and Rosa Lee Dorris). Alvin was born in Oklahoma. Oliver was the son of Thomas Monroe Pitt and Mary Isabella/Belle Armor/Armer Ray. Rosa was the daughter of George Washington Dorris and Nanny Rosalene/Rosaleen Smith. Brad’s paternal grandmother was Elizabeth Jean Brown (the daughter of Lester Benny Brown and Una Valerie Coker). Elizabeth was born in Oklahoma. Lester was the son of William Henry Brown and Minnie Martha Moore. Una was the daughter of Richard Ogle Coker and Laura Tryphena/Trephena Trotter. Brad’s maternal grandfather was Hal Knox Hillhouse (the son of Emory/Emery A. Hillhouse and Etta Colemon/Colman/Coleman Williams). Hal was born in Missouri. Emory was the son of Elijah Boyd Hillhouse, Jr. and Malinda/Melinda Burrel/Burrell Morris. Etta was the daughter of Henry Thomas Williams and Ida Mae/May Isbell. Brad’s maternal grandmother was Clara Maurine/Mae Bell (the daughter of Finis Alonzo/Alonza Bell and Lenora Jane Hammer). Clara was born in Missouri. Finis was the son of William Saterfield/Satterfield Bell and Sarah Elizabeth Neece. Lenora was the daughter of Felix Emery Hammer and Sarah Angeline Parker. Brad’s seven times great-grandfather, John Johannes Hammer, was born, c. 1683, in Palatimate, Germany.